WhatsApp Messenger is one of the most popular apps in the history of Internet. With over 3 billion of downloads; it is currently #1 downloaded messaging app. The reason is because it is free and you can send message, video call to your friends or family. Although it consumes your phone's internet service whether you are using 4G/3G/2G/EDGE or Wi-Fi. Not only that, it also let you send and receive multimedia files such as picture, music, video and so on. However, if you are looking to print WhatsApp messages for some reasons, then you have come to the right place. There are many cases for which you need to produce a hard copy of your conversation between you and a third party for legal evidence. Either way, there are three ways to print out your WhatsApp conversation that we will be discussing in this article. 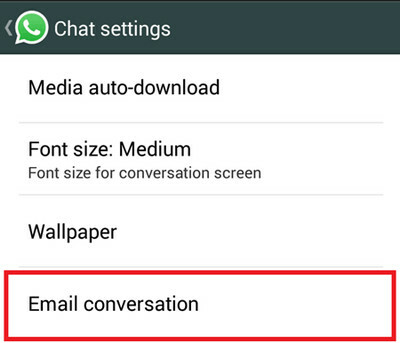 Step 1: Open WhatsApp application on your Android device. Step 2: Now open the conversation tab of the user you want to take the print out for. After you have opened the chat window of that person, tap on the three-dotted menu option on the top right corner and click on More. Step 3: Once you click on the more option, you will be able to see a pop up on the screen. From there, you have to click on the option that says Email Conversation. Step 4: Now once you tap on Email Conversation, you will be prompted with two options whether to Email Conversation with media or without media. If you tap on with media then all the multimedia files such as pictures, video, audio and so on will also be emailed to you and if you tap on without media option then it will email conversation without any multimedia files. Step 5: After you choose an option, you will see another pop up with several email clients. We are going to take Gmail as an example in this guide. So, simply tap to Gmail icon. Step 6: Once you tap on Gmail icon, the full conversation will be attached to Gmail and you will have to fill in an email ID in which you want to send the conversation. Once you see the full text conversation list, simply click on the print icon or press CTRL+P simultaneously to print the entire conversation. Step 7: Open Gmail from a computer or laptop and find the email and open it. Use the web version to see the image and text attached. Step 8: If you are using Google Chrome as your default browser then you will be able to save a PDF file of the conversation too. There is a popular saying in nowadays: time is money. For most of the people, the above method is too complicated and takes a lot of time for such a simple task. The fact is that there is a much more convenient solution to complete the task by using Androidphonesoft WhatsApp Transfer. 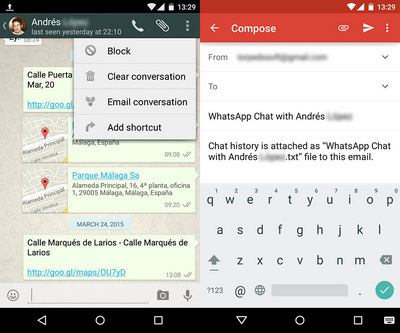 It can directly print WhatsApp messages on Android and iPhone with a few clicks. Here are the steps to get it done. Step 1: Download and install Androidphonesoft WhatsApp Transfer. Step 2: Open the program and connect your Android phone to computer. Make sure usb debugging is enabled on the device. Step 3: Select a contact from the left side bar and right click on it. There are several options popping up. Choose "Print Messages with this Contact". Then all WhatsApp messages will be printed on a paper. This app is also able to move Android WhatsApp messages to iPhone and transfer messages to computer. If you use WhatsApp heavily, then Androidphonesoft WhatsApp Transfer is a good tool to keep with. 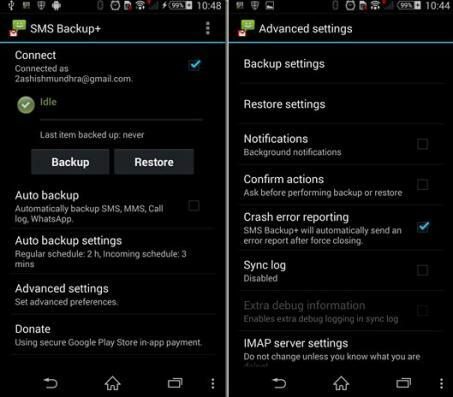 For this method to work, you need to download a third party application from Google play store called SMS Backup+ . The application is free and extremely easy to use. Once you finished installing the app, you will have to launch the application first. After you launched the app, the first thing it will ask you to grant permission over your Gmail account. When that is done, just tap on Backup button. This application is perfect to back up your text messages as well as WhatsApp messages. You can either backup entire WhatsApp messages or you can simply select the specific conversation and back it up as a text file. Use the following steps to email your WhatsApp messages to your Gmail account. Step 1: Launch the application and click on WhatsApp settings. Step 2: After that tap on Chat settings. Here, tap on Backup Conversations option. Step 3: To export an individual conversation, tap and hold on the selected person or group. Step 4: From there, click on Email conversation. Once the email is sent to your Gmail account, you can print out just like any other text files. So, that is how you transfer your WhatsApp messages from one medium to another. 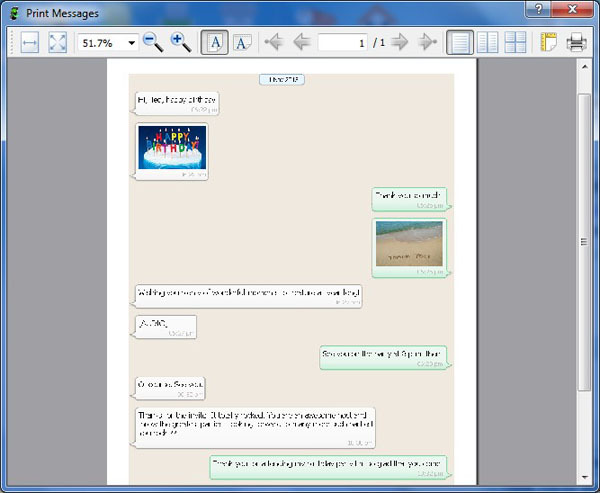 You can use the same method to transfer and print your text messages too. This tip is really very useful if you need provide any evidence of your conversation with a third party contact. There are several other application in Google Play Store to print WhatsApp messages but the above mentioned methods are tested and 100% working.